Definition at line 50 of file llviewercamera.h. Definition at line 53 of file llviewercamera.cpp. References calcProjection(), DEFAULT_FIELD_OF_VIEW, f, LLCamera::getFar(), i, mCameraFOVDefault, mGLProjectionMatrix, mPixelMeterRatio, mScreenPixelArea, mZoomFactor, mZoomSubregion, and S32. Definition at line 625 of file llviewercamera.cpp. References face, FALSE, LLVolume::getNumVolumeFaces(), LLVOVolume::getRelativeXform(), LLViewerObject::getRenderPosition(), LLViewerObject::getRenderRotation(), LLPrimitive::getVolume(), LLVolume::getVolumeFace(), i, LLDrawable::isActive(), LLViewerObject::mDrawable, LLCamera::pointInFrustum(), S32, LLVOVolume::updateRelativeXform(), and v.
Definition at line 119 of file llviewercamera.cpp. References f, LLCamera::getAspect(), LLCamera::getNear(), LLCamera::getView(), LLMatrix4::mMatrix, mProjectionMatrix, and LLMatrix4::zero(). Referenced by getProjection(), and LLViewerCamera(). Definition at line 620 of file llviewercamera.cpp. References gAgent, LLCoordFrame::getOrigin(), LLAgent::getRegion(), LLViewerRegion::getWaterHeight(), LLVector3::mV, and VZ. Referenced by LLDrawPoolWater::render(), LLDrawPoolWater::renderShaderSimple(), and LLDrawPoolWater::shade(). Definition at line 75 of file llviewercamera.h. Referenced by idle(), and LLHoverView::updateHover(). Definition at line 81 of file llviewercamera.h. Referenced by LLFloaterAnimPreview::postBuild(), LLImagePreviewSculpted::render(), LLImagePreviewAvatar::render(), LLPreviewAnimation::render(), LLSelectNode::renderOneSilhouette(), update_fov(), and LLAgent::updateCamera(). Definition at line 111 of file llviewercamera.cpp. References LLCoordFrame::getMatrixToLocal(), mModelviewMatrix, and OGL_TO_CFR_ROTATION. Referenced by LLManipTranslate::highlightManipulators(), LLManipScale::highlightManipulators(), LLDrawPoolWater::render(), LLDrawPoolWater::renderShaderSimple(), and LLPipeline::setupAvatarLights(). Definition at line 87 of file llviewercamera.h. Referenced by LLManip::getSubdivisionLevel(), LLManipTranslate::renderSnapGuides(), LLVOAvatar::setPixelAreaAndAngle(), LLViewerObject::setPixelAreaAndAngle(), LLVOPartGroup::updateGeometry(), and LLManipScale::updateSnapGuides(). Definition at line 577 of file llviewercamera.cpp. References f, LLCoordFrame::getAtAxis(), LLViewerWindow::getDisplayScale(), LLCoordFrame::getLeftAxis(), LLCoordFrame::getOrigin(), LLWindow::getPixelAspectRatio(), LLCoordFrame::getUpAxis(), LLCamera::getView(), LLCamera::getViewHeightInPixels(), LLViewerWindow::getWindow(), gViewerWindow, LLVector2::mV, right, VX, and VY. Referenced by hud_render_text(), LLVOAvatar::idleUpdate(), LLHUDIcon::renderIcon(), LLHUDText::renderText(), LLHUDText::updateScreenPos(), and LLHUDText::updateVisibility(). Definition at line 85 of file llviewercamera.h. Referenced by LLAgent::changeCameraToFollow(), and LLSelectNode::renderOneSilhouette(). Definition at line 104 of file llviewercamera.cpp. References calcProjection(), LLCamera::getFar(), and mProjectionMatrix. Referenced by LLManipTranslate::highlightManipulators(), and LLManipScale::highlightManipulators(). Definition at line 88 of file llviewercamera.h. Referenced by LLVolumeImplFlexible::doIdleUpdate(), LLSpatialPartition::renderDebug(), LLViewerObject::setPixelAreaAndAngle(), and LLVOVolume::updateTextures(). Definition at line 74 of file llviewercamera.h. Referenced by idle(), LLHUDText::updateAll(), and LLHoverView::updateHover(). Definition at line 91 of file llviewercamera.h. Referenced by LLViewerWindow::draw(), render_ui_2d(), and setup_hud_matrices(). Definition at line 92 of file llviewercamera.h. Definition at line 337 of file llviewercamera.cpp. References f, FALSE, LLCoordFrame::getAtAxis(), LLViewerWindow::getDisplayScale(), LLCoordFrame::getOrigin(), LLViewerWindow::getWindowRect(), gGLModelView, gGLViewport, gViewerWindow, lltrunc(), LLVector3::magVec(), LLRectBase< Type >::mBottom, mGLProjectionMatrix, LLRectBase< Type >::mLeft, LLRectBase< Type >::mRight, LLRectBase< Type >::mTop, LLVector2::mV, LLVector3::mV, LLCoord::mX, LLCoord::mY, S32, TRUE, VX, VY, VZ, x, y, and z.
Referenced by LLTracker::drawMarker(), LLToolGrab::handleHoverActive(), LLManipTranslate::handleMouseDownOnPart(), LLToolCamera::handleMouseUp(), LLToolGrab::onMouseCaptureLost(), LLHUDText::renderText(), roundToPixel(), LLHUDText::updateScreenPos(), and LLManipRotate::updateVisiblity(). Definition at line 441 of file llviewercamera.cpp. References f, FALSE, LLCoordFrame::getAtAxis(), LLViewerWindow::getDisplayScale(), LLRectBase< Type >::getHeight(), LLCoordFrame::getOrigin(), LLViewerWindow::getVirtualWindowRect(), LLRectBase< Type >::getWidth(), gGLModelView, gGLViewport, gViewerWindow, lltrunc(), LLVector3::magVec(), LLRectBase< Type >::mBottom, mGLProjectionMatrix, LLRectBase< Type >::mLeft, LLRectBase< Type >::mRight, LLRectBase< Type >::mTop, LLVector2::mV, LLVector3::mV, LLCoord::mX, LLCoord::mY, S32, TRUE, VX, VY, VZ, x, y, and z. Definition at line 321 of file llviewercamera.cpp. References gGLModelView, gGLViewport, mGLProjectionMatrix, LLVector3::setVec(), x, y, and z.
Referenced by LLManipRotate::mouseToRay(), and roundToPixel(). Definition at line 684 of file llviewercamera.cpp. 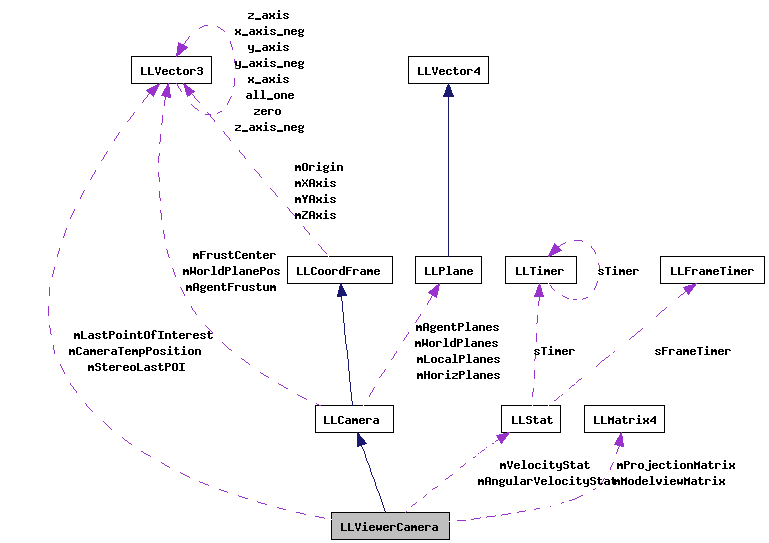 References LLControlGroup::getF32(), LLCoordFrame::getLeftAxis(), LLCoordFrame::getUpAxis(), gSavedSettings, mCameraTempPosition, mStereoLastPOI, LLVector3::normVec(), and updateCameraLocation(). Definition at line 702 of file llviewercamera.cpp. Definition at line 593 of file llviewercamera.cpp. References FALSE, LLCoordFrame::getOrigin(), LLCoord::mX, LLCoord::mY, LLVector3::normVec(), projectPosAgentToScreen(), and projectScreenToPosAgent(). Definition at line 80 of file llviewercamera.h. Referenced by LLViewZoomDefault::handleEvent(), and update_fov(). Definition at line 188 of file llviewercamera.cpp. References bottom, LLCamera::calculateFrustumPlanesFromWindow(), f, FALSE, gAgent, LLControlGroup::getBOOL(), LLControlGroup::getF32(), LLCamera::getFar(), LLCamera::getNear(), LLCoordFrame::getOpenGLTransform(), LLCamera::getView(), LLViewerWindow::getWindowHeight(), LLViewerWindow::getWindowWidth(), gGLModelView, gGLViewport, glGetIntegerv, glLoadMatrixf, glMultMatrixf, glRotatef, glTranslatef, gProjectionMat, gSavedSettings, gViewerWindow, left, llceil(), MAX_FAR_CLIP, LLAgent::mDrawDistance, mGLProjectionMatrix, mZoomFactor, mZoomSubregion, OGL_TO_CFR_ROTATION, RAD_TO_DEG, right, top, TRUE, and updateFrustumPlanes(). Referenced by LLViewerWindow::analyzeHit(), LLToolSelectRect::handleRectangleSelection(), LLViewerWindow::hitObjectOrLandGlobalAsync(), LLVisualParamHint::render(), LLImagePreviewSculpted::render(), LLImagePreviewAvatar::render(), LLPreviewAnimation::render(), and LLViewerWindow::setup3DRender(). Definition at line 90 of file llviewercamera.h. Referenced by display(), and LLViewerWindow::rawSnapshot(). Definition at line 68 of file llviewercamera.cpp. References LLStat::addValue(), gAgent, LLQuaternion::getAngleAxis(), LLCoordFrame::getAtAxis(), LLCoordFrame::getOrigin(), LLAgent::getPositionAgent(), mAngularVelocityStat, LLCamera::mAspect, mCameraFOVDefault, mLastPointOfInterest, mPixelMeterRatio, mScreenPixelArea, mVelocityStat, LLCamera::mViewHeightInPixels, S32, LLCoordFrame::setOriginAndLookAt(), LLQuaternion::shortestArc(), tanf, x, y, and z.
Referenced by rotateToLeftEye(), rotateToRightEye(), and LLAgent::updateCamera(). Definition at line 145 of file llviewercamera.cpp. References LLCamera::calcAgentFrustumPlanes(), LLCamera::getFar(), LLCoordFrame::getOrigin(), glGetIntegerv, i, LLVector3::normVec(), and LLVector3::setVec(). Referenced by display(), LLPipeline::generateReflectionMap(), and setPerspective(). Definition at line 675 of file llviewercamera.cpp. References LLCoordFrame::getOrigin(), mCameraTempPosition, mLastPointOfInterest, and mStereoLastPOI. Definition at line 106 of file llviewercamera.h. Referenced by getAngularVelocityStat(), and updateCameraLocation(). Definition at line 109 of file llviewercamera.h. Referenced by getDefaultFOV(), LLViewerCamera(), setDefaultFOV(), and updateCameraLocation(). Definition at line 117 of file llviewercamera.h. Referenced by rotateToLeftEye(), rotateToRightEye(), and updateStereoValues(). Definition at line 122 of file llviewercamera.h. Referenced by LLViewerCamera(), projectPosAgentToScreen(), projectPosAgentToScreenEdge(), projectScreenToPosAgent(), and setPerspective(). Definition at line 110 of file llviewercamera.h. Referenced by getPointOfInterest(), updateCameraLocation(), and updateStereoValues(). Definition at line 108 of file llviewercamera.h. Definition at line 111 of file llviewercamera.h. Referenced by getPixelMeterRatio(), LLViewerCamera(), and updateCameraLocation(). Definition at line 107 of file llviewercamera.h. Referenced by calcProjection(), and getProjection(). Definition at line 112 of file llviewercamera.h. Referenced by getScreenPixelArea(), LLViewerCamera(), and updateCameraLocation(). Definition at line 118 of file llviewercamera.h. Definition at line 105 of file llviewercamera.h. Referenced by getVelocityStat(), and updateCameraLocation(). Definition at line 113 of file llviewercamera.h. Referenced by getZoomFactor(), LLViewerCamera(), setPerspective(), and setZoomParameters(). Definition at line 114 of file llviewercamera.h. Referenced by getZoomSubRegion(), LLViewerCamera(), setPerspective(), and setZoomParameters().